Professional packing of every item imaginable, to meet regulatory needs and ensure your items arrive as they left. 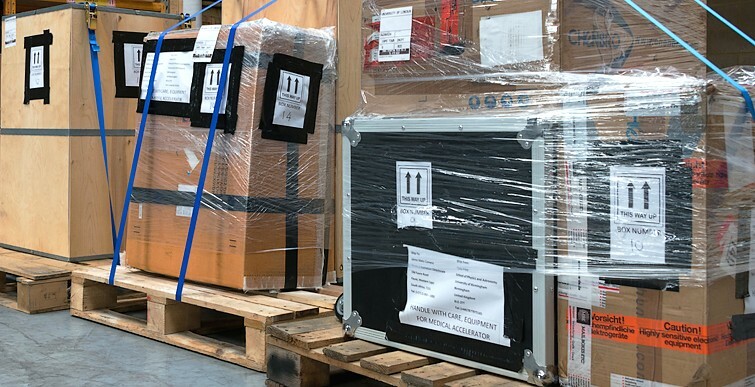 We are asked to pack many differing items, from delicate antiques, to sensitive electronic equipment, to vehicles, aircraft, or entire film sets. Each deserve unique care and attention. Bespoke packing and crating is an engineering discipline, at times a science. Both are knowledge based and the experience of Dynamic’s packing team helps ensure good decisions are made. Their skills are available at our warehouses, or on site, at your workplace, or home. Crates and casing can be created to fit at any location. Dedicated equipment can be provided, from tilt display devices, to multiple containers. Supporting techniques, such as using dry ice, or corrosion inhibitors come from well trained materials handling staff. Increasingly stringent regulations on the movement of goods deemed as dangerous appear each year. They can apply to any mode of transport, although especially so for air freight. Our fully qualified and certified staff undertake collection, packing to IATA standards and safe despatch by air. All in the same day if need be and always with maximum safety in mind. Whatever form of transport is being used, our bespoke approach applies. Transporting pyrotechnics, paints, chemicals, adhesives, compressed gasses, or other hazardous goods is planned and managed. Although trade is global, regulations are not and can vary widely on packaging materials. From whether the materials are degradable, or recyclable, to marking and labelling requirements. Not meeting requirements often brings frustration, potentially business, or personal delay. Dynamic’s packing staff have experience of regulations at a wide variety of destinations and will act accordingly. We offer as much free advice as you need and quote accurately for custom packing, or crating. A service able to meet every UK, or export need. Oversize, or heavy haul transportation is not a problem, neither are fragile, temperature sensitive, or unusually shaped items. Above all, our packing staff treat each individual item as important. Dynamic is a company built on personal support and the relevance of this to packing should not be underestimated. We look forward to working with you, to ensure your goods arrives safely. We mentioned the regulatory needs on air freight, which can extend into areas beyond packing and crating.